After the 7.0 earthquake rocked Haiti on January 12th of 2010, Jeremy was deeply moved as most of you were. For days he watched as the television flashed images of gloom and doom… dead bodies, crumbled buildings… It just felt like a heartless display of numbers and statistics. “How were the people feeling?” he wondered. He was tired of hearing endless reports from strangers that just arrived to this devastated nation. So he decided to go to Port-Au-Prince himself and ask them directly. He gave them art supplies to write on found rubble and his question was simply “What do you have to say about all this?” This photo essay reveals the many answers to that question. We heard that evening that there was a wedding taking place. Immediately we started driving around in the general area where the wedding was and we finally found it. The bride and groom were walking out the door as we pulled up. We explained the concept and they agreed right away. As soon as we asked them if they knew what they had to say, they wrote down “Love Conquers All.” It was a stunning statement for such a devastating time of need. After the photo was taken, we drove them to their “honeymoon” in a tent city. This woman saw everything she owned collapse right in front of her. She now lives in a tent city among hundreds of thousands of others on what used to be Haiti’s only golf course. “Having My Leg Chopped Off Is Nothing. This is a very common thought in Haiti. When I was there, the government was completely missing. Even cops were nowhere to be found. Haitians can get through injury and suffering. But they still need leadership. The rainy season is something Haitians fear even in the most normal of times. The quake destroyed over 250,000 houses and the homeless are now looking through the rubble for any piece of scrap to build themselves a new home. In Haiti, even before the quake, few people had access to schools. Official numbers are saying 90% of the schools were destroyed by the earthquake… elementary, middle, high schools, colleges, everything. This young man knows that something must change in order for his life and the life of his friends to get better. Before the earthquake, Jimmy was in law school and minoring in English. His plan was to be the provider for his family pictured here. His school was destroyed in the earthquake. This photo is half sarcasm, half sincerity. He is completely distraught and clueless as to how he is going to rebuild his home and his life. But he loves Haiti and has determination to rebuild. For 6 long days Christian searched the rubble for his older sister. He found her just before they gave up on the 7th day as someone was about to throw her in the trash. He said, “Hey, she’s not trash, she’s my sister!” He brought her home that day and buried her here in his front yard underneath where he’s sitting. 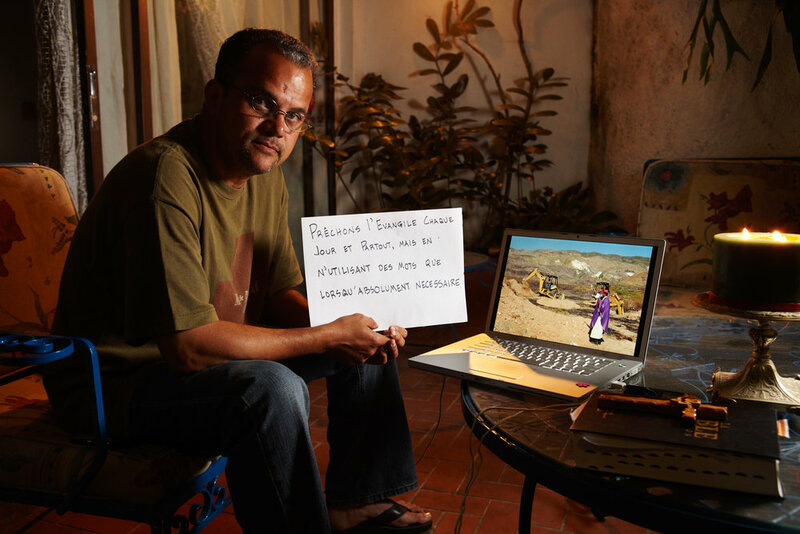 He worked all his life to dig this spot out of the mountain by hand and build a home for his wife and six kids. Standing in the rubble of what was once his house, he is eager to rebuild but has no money to do so. The marks on her arm are from a severe car accident she was in 2 years ago. She says she has miraculously dodged death many times in her life. She even lost her entire family in the earthquake. I’m honestly not sure that I’ve ever met a kinder, more gentle person in my life. We had a great connection and I bought her some nice, cold drinks after this photo. We were taking pictures on the main boulevard in Downtown Port-Au-Prince when this woman walked by and said that she had a message to tell the world. Haitians are hard workers, all they need is jobs. When we arrived at the tent city in Ste Therese Parc, Bruno, 28, father of two, was put in charge of his part of the camp. He was the first one to greet us and instantly wanted to participate. I love his message. It’s the perfect example of the strength and resiliance of the Haitian people. Tent cities have poppepd up everywhere. Hundreds of thousands of homes are destroyed. This sign should be the entrance sign for all of Port-Au-Prince. When you combine a couple hundred thousand people living under sheets and sticks on hills made of dirt, you can imagine why they’re aftraid of the rain. There are about 13,000 US soldiers in Haiti now. It is a tough job to keep a positive mindset when you are trying to help crowds of thousands of hungry people. We caught him spraying his prayer over each wall he encountered on his way to town. I was fascinated by this simple message. When we encountered all these children, I knew right away what I wanted to do. I wanted to give them some of my art supplies and just let them escape for a while. That they did. That simple little gift might have been the most useful thing I did on my Haiti trip. They were glowing with those markers and for a while, they forgot all about their injuries. Amidst all of the destruction in downtown Port au Prince, we came across this kid washing his bike in a puddle of water. I remember an adult coming up and saying “Why are you photographing children?? They have nothing to say!” This little boy immediately wrote this when we handed him the marker. Mammie is “Mommy” to over 70 girls from the ages of 1-20 in her orphanage in Delmas 31. We spent a lot of time with Mammie that day. Her heart was beyond broken when she spoke to us privately. But the way she showed strength when the girls were paying attention was awe-inspiring. Haitians have extreme respect for the dead. Most of the time they build them a crypt that’s nicer then their home.” After seeing thousands of bodies being improperly buried on TV, he went to the mass graves himself and personally buried 2,500 earthquake victims the day before this photo was taken. He took Priests with him and they delivered quick ceremonies for every burial. We were walking downtown when this man’s bus (tap tap) caught our eye. We told him about the project and he agreed right away. Ironically, as we were taking this picture we could hear gunshots being fired about 100 yards away. Haiti needs help. They need a long term relationship with qualified people, engineers, doctors, teachers, leaders to help rebuild and put the country on steady tracks. This guy was walking around the streets just shell-shocked. 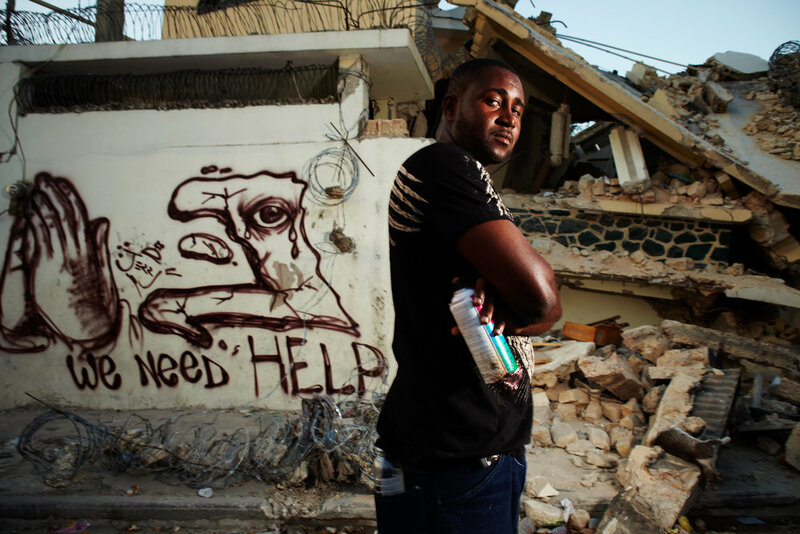 We found him here standing in front of the rubble of the Port-Au-Prince Cathedral. You don’t see many men visibly carry heartbreak quite like he did. He had lost his only daughter and her drivers license was the ONLY possession of hers that he owned anymore. This moment was tremendously heavy for my team. I remember my assistant Julie just weeping after we talked to him. This is yet another moment and story that I’ll never forget. For a minute I would be very inspired to see so many doctors and nurses working together from all around the world. (This man was a French doctor). Then I would be reminded of the harshness of the situation. They could do very little due to the lack of supplies. This man is a pastor who lost his daughter in the earthquake but as you can see, hasn’t lost his faith. This man used to own a barbershop, which he reinstalled in this tent where a few people are living with him now. His message reinstates his actions. A natural disaster is one thing. A natural disaster without any leadership is a new level of devastation. Everwhere we went, people echoed this sentiment. 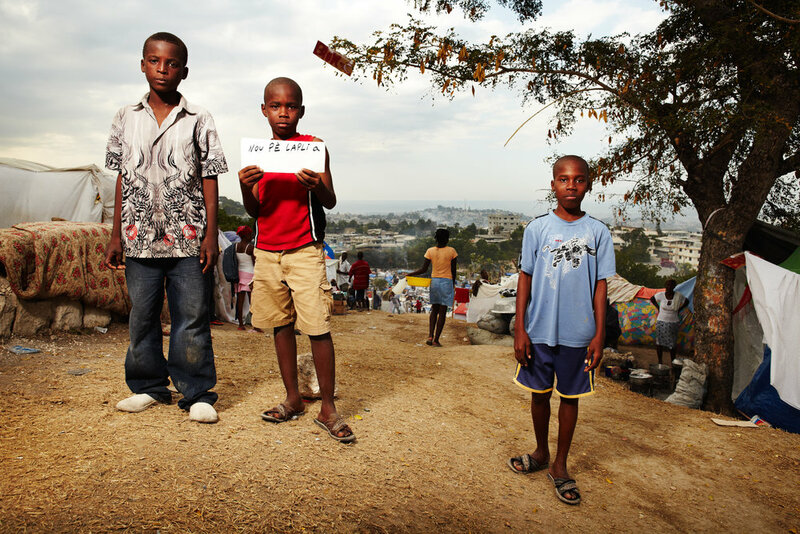 In Haiti, the ones who get to go to school are considered the lucky ones. WIth 90% of schools destroyed, the luck is gone. She worked as a house-keeper until the house fell down and the owners left Haiti. Now she’s trying to make a living by selling candy. She was the rare person who wouldn’t smile no matter what we said. She made her devastation clear. We were at least able to purchase lots of candy and food from her to help. The wall of her backyard fence fell on her back. The house was completely destroyed but in typical, inspiring Haitian form, she’s just thankful for what she has left… her family. As we stopped to take a picture this woman approached us asking for help. When we asked her what she had to say, she said that the only thing she wants is a can of milk for her kids. On a side note, this is one of three crosses I saw still standing. All three churches had been completely destroyed but the crosses stood unrattled. His irrepressible joy made this 3 year old boy everyone’s favorite kid at the hospital where he was staying. He was found under the rubble of his house with a severely injured arm but when around him, it was easy to forget what he had endured. There’s a Haitian saying that goes: “Children are wealth.” In the Haitian culture it means that the more kids you have the more you can cultivate the land. The youth represents the future, and education is a a top priority. Doctors used to treating disaster victims say Haiti is unlike anything they’ve experienced before. But the worst part is, it’s all unnecessary. The technology exists to keep this level of suffering from happening. She found a certain support system in the community because they are all bearing the weight of this disaster. He spent his whole life building his house and it was destroyed in the hills behind him.